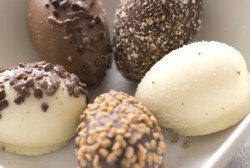 Holiday chocolates for special occasions are a must! Every holiday and special event deserves to be celebrated with everyone's favorite treat, chocolate candy! You can whip up a scrumptious recipe to impress your family and friends, or you can find some lovely chocolate gift candy to spoil someone rotten. I've divided this page up into categories for the various holidays. I hope you'll find something that suits your needs perfectly. But, wait! If you have a favorite chocolate candy recipe or gift idea to add to the list, please don't keep it to yourself. Use the convenient form to share it with the rest of us. If your mother is half as wonderful as mine is, you are going to want to go all out to pamper and spoil her for Mother's Day. Holiday chocolates for Mother's Day are also great for wives, grandmothers, aunts, teachers and any other lady who has made an impact in your life - yes, even mothers-in-law! Do you do something special for your Dad for Father's Day? I hope so. Some people don't appreciate how much men like to be spoiled, too. Sometimes I think they enjoy it even more than we girls do! You can 'man' your gift up a bit by getting something theme related. Golf, football, racing, gardening, fishing, etc. Be creative and make the men in your life feel like a million bucks! Do you celebrate Halloween? If so, check out these creative ideas for fun and scary Halloween treats. Even if you don't use them for an actual 'Halloween' party, these great holiday chocolates ideas can be used for a party any time of year! Kids love to be scared in a pleasant way. They also get a kick out of gory and gross things. You'll make their day with something a little out of the ordinary and spooky. Christmas is a special time of year. It just seems like everyone is in a better mood. Strangers greet you on the street with a smile. People spend time thinking of little treasures to share with others to brighten the season. Holiday chocolates are just the thing. If you are looking for some delicious Christmas candy recipes or ideas for chocolate Christmas gift giving, here's a list for you to browse. Now, don't forget to share your favorite Christmas candy recipes with the rest of us! I hope these holiday chocolates ideas will inspire you to get in the kitchen and get to work. If that isn't for you, the gift ideas will help you find something special. Happy Holidays!